BOW ARTS TRUST’S LIVE/WORK SCHEME is a collaboration with registered social land­lord Poplar HARCA. It is a unique initiative offering artists and creative practitioners ac­cess to affordable short life Live/Work spaces. The project is designed to support artists and promote culture within communities. The scheme runs in Poplar, within the London Borough of Tower Hamlets, one of the poorest wards in the country. The area is targeted for massive regeneration but this is a long process of change and rebuilding which often leaves communities in a vulnerable state. The decanting process is exceptionally disruptive and exaggerated by frequent disruptions caused through political and economic change. Social Landlords try to use short life housing schemes to bridge this gap. HARCA found itself in possession of a growing number of redundant flats that were uneconomic to bring back into any use at all. These properties were expensive to keep empty and they attracted antisocial behaviour, criminal activity and squatting. In 2007 Bow Arts proposed that Poplar HARCA give over some of these redun­dant flats for artists to use as Live/Work spaces. This would bring these empty properties back into use, provide artists with a much-needed place to live as well as space to work. It would offer an opportunity for artists to be embedded at the heart of the community and contributing towards regenerating the local area. Poplar HARCA agreed to the scheme across their entire district, understanding that artists form a natural community who will work towards the regeneration and aesthetic improvement of their environment. There would be a zero cost to their residents and Poplar HARCA they would save the cost of security and maintenance of the properties. Through this scheme Bow Arts acts as the landlord and undertakes gas and electrical certification of all flats. It also does the first fix of windows and doors and makes good the basic plumbing. The rest is paid by the successful artist. The scheme intends to help artists thrive economically as well as artistically. Rents are based on af­fordable social housing rates. Two-thirds of the rent contributes to the running costs of the scheme and a third goes into a Community Arts Chest that delivers a programme of high quality, sustainable community art projects for local people. Artists on the scheme are able to access work and opportuni­ties through the Arts Chest. The fund generates around £50,000 annually. Artists on the scheme are selected based on a number of criteria, including their commitment to community engagement, current earning levels as well as their artistic practice. To this end they are very visible and play an active role on resident panels. Many are involved in or are the instigators of community events. One artist set up workshops that ran as drop in sessions for young Bengali women who found integration hard. The project taught printing techniques on fabric that were then made into bedspreads, cushions and other textiles. These were sold through the local community. The project is now about to train its first three new workshop leaders from the original group to set up their own workshops. The Live Work scheme currently manages 65 flats with over 100 artist occupants. Hundreds of projects have taken place and around £40,000 of additional grant funding has been raised to support the arts in this area. • 1/3 of the rent goes directly into an Arts Chest supporting high quality local arts activity . • The Live/Work scheme provides opportunities for the community, especially young people, to raise their aspirations and access creative industry and other career opportunities. • The local community enjoys a safer, more pleasant area with occupied buildings full of life and vibrancy. • The project is a no-cost solution to the problems associated with empty properties. • Direct saving on rates, anti-squatting measures, maintenance, policing & anti-social behaviour. • The artists taking part in the Live/Work scheme make a sustained, consolidated contribution to the communities of the estates. • Working with the Bow Arts Trust helps Poplar HARCA to fulfil its mandate to support residents and work towards the regeneration of the area. • Studio and living costs are consolidated into one affordable space so artists can concentrate on their work without having to take on part-time work to cover studio costs. • The social enterprise model which the Live/Work scheme operates helps artists succeed economically and therefore artistically. • Engaging with the local community helps artists to grow in confidence and can add a new dimension to their practice as well as supporting their work financially. • Live/Work artists can support each other, whether with a friendly cup of tea or sharing skills and experience and so a community of artists is growing. 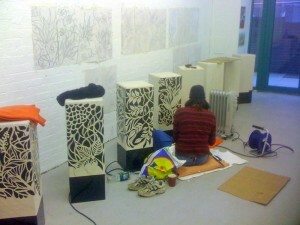 One of the artists in her Live Work flat in the Leopold Estate, Poplar, London E3 at work on the final stages of a art project funded through the Community Arts Chest and Tower Hamlets, which produces a series of bollards as part of a renewed streetscape. The designs were worked up as part of a workshop with young Bengali women, and then transferred to the bollards by the artist Bhajan Hunjan. An image by artist Simon Terrill, who was artist in residence at Balfron tower, funded through the Community Arts Chest and Arts Council England. 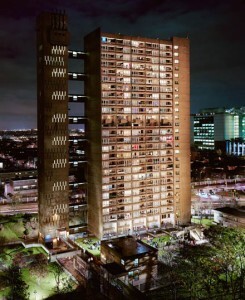 This project was a major public community artwork, which after several months of engagement with local residents resulted in a large ‘group portrait’ of the residents and the Balfron Tower.